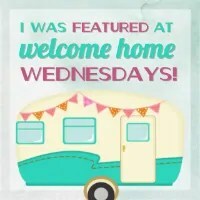 Welcome to Welcome Home Wednesdays #70!!! Everybody ready for the holidays? I’ve still got a few gifts to buy and some treats to make. This weekend will be all about wrapping! It’s my tradition to put the movie Love Actually on and wrap presents. What are your holiday traditions? Like any good hosts we’re sitting right by the present table waiting until our guests leave so we can go through the loot… the loot being your Welcome Home Wednesdays #70 links! We can’t wait to check out what you’ve left for us. Trust me there will be a lot of pinning, tweeting and facebook sharing going on in the near future… we can’t wait to show off what you’ve left! Thank you for hosting all year. I always look forward to this party. Have a warm and safe week! Thanks for bringing your smiling face every week, Marilyn! Cheers to a wonderful new year! Erin, thank you for hosting. Sounds like a good way to wrap gifts! For the first time in a long time, I actually have all my gifts wrapped except for the few I am waiting to arrive in the mail. Then there are the PJs to make but I am ahead of the game! Have a great week! Wow, good for you Dianne! That must feel really good to have wrapping checked off your list! Enjoy your week! Thanks for linking up, Charlene!